Against all odds, NASA's Deep Space 1 not only survived its daring encounter with Comet Borrelly but also returned stunning pictures of the comet's hidden nucleus. 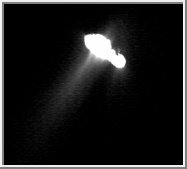 September 25, 2001 In a risky flyby, NASA's experimental Deep Space 1 (DS1) probe successfully navigated past the heart of Comet Borrelly last Saturday, September 22nd. 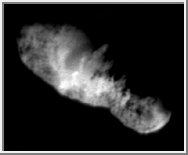 Whizzing just 2,200 kilometers from Borrelly's rocky, icy core, DS1 captured the best-resolution pictures to date of any comet's nucleus. Onboard instruments also measured the composition of gases swirling around the nucleus and revealed new information about how those gases interact with the solar wind. Before the encounter, mission planners weren't certain that DS1 would survive its rendezvous with Borrelly. After all, the craft was designed for a technology-testing mission -- long ago completed with great success -- and not for a comet flyby. Deep Space 1 sped through the comet's turbulent coma (a hazy cloud of gas and dust surrounding the core) with no shielding from gaseous jets or potentially damaging bits of flying comet dust. Nevertheless, the flyby was a big success. "Deep Space 1 plunged into the heart of Comet Borrelly and has lived to tell every detail of its spine-tingling adventure!" 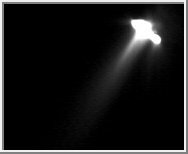 said Dr. Marc Rayman, the project manager of Deep Space 1 at the Jet Propulsion Laboratory (JPL), Pasadena, Calif. "The images are even better than the impressive images of comet Halley taken by Europe's Giotto spacecraft in 1986." Rayman added, "After years of nursing this aged and wounded bird -- a spacecraft not structured to explore comets, a probe that exceeded its objectives more than two years ago -- to see it perform its remarkably complex and risky assignment so well was nothing short of incredible." "It's mind-boggling and stupendous," agreed Dr. Laurence Soderblom, the leader of Deep Space 1's imaging team, and a geologist with the U.S. Geological Survey, Flagstaff, Ariz. "These pictures have told us that comet nuclei are far more complex than we ever imagined. They have rugged terrain, smooth rolling plains, deep fractures and very, very dark material." Scientists also realized that Borrelly was different than they expected as Deep Space 1 flew through the dusty gaseous coma. They had expected that the solar wind (a stream of charged particles flowing from the Sun) would flow symmetrically around the coma with the nucleus in the center. 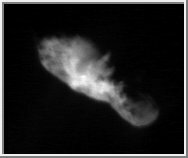 The solar wind did indeed flow symmetrically around the cloud, but the nucleus was off to one side shooting out a great jet of material forming the cloud that makes the comet visible from Earth. "The formation of the coma is not the simple process we once thought it was," said Dr. David Young of the University of Michigan, Ann Arbor, leader of the team that made the measurements. "Most of the charged particles are formed to one side, which is not what we expected." More surprises may await scientists in the data beamed back from DS1. It's only been a few days since the speedy encounter, note researchers -- not enough time to completely explore the data set. The most extraordinary discoveries may be yet to come.